Long anticipated, 4K HDR streaming video is coming to the Apple TV. As announced at the Apple press event today, the first ever held at the Steve Jobs Theater in Apple Park, 4K streaming will be available on the new 5th generation Apple TV, which has been dubbed the ‘Apple TV 4K.’ The new Apple TV also supports HDR televisions with HDR10 and Dolby Vision. The Apple TV’s new capabilities are powered by an A10X Fusion chip, the same chip that powers the iPad Pro. Based on the iOS 11 gold master leak last weekend, the Apple TV 4K's content will be displayed at 2160p resolution, which is twice the standard 1080p HD resolution. 4K content on iTunes will be priced the same as existing HD content, and any HD content you already own will be upgraded for free to 4K resolution. 4K content will also be available from third-party streaming services including Netflix and, later this year, Amazon Prime Video. Apple also announced that later this year, it will debut live sports and news inside its TV app. When browsing available sports, the Apple TV will display the time remaining in a game and the score to help you decide what to watch. However, the score display can be turned off if you'd prefer not to know. The TV app is also expanding to include Australia and Canada this month and France, Germany, Norway, Sweden, and the UK later this year. 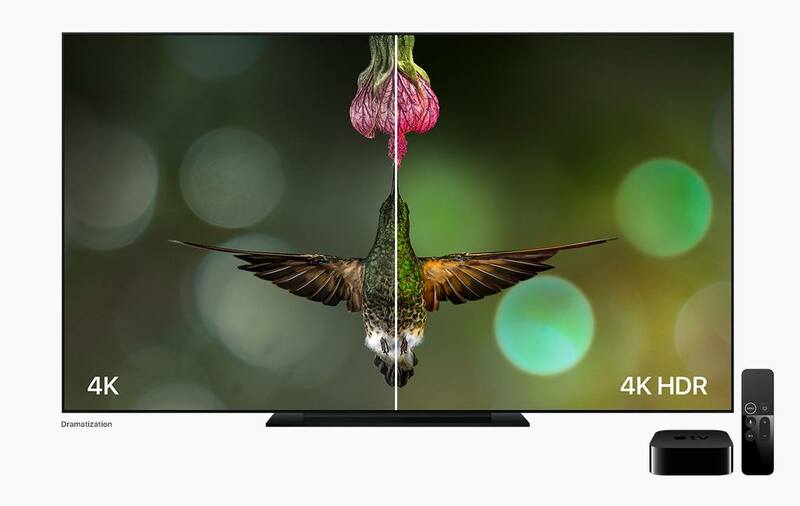 The update to Apple’s television-connected box brings it in line with other hardware manufacturers who have offered 4K video support for a while. With more 4K content available than ever before from providers like Netflix, Hulu, and Amazon Prime Video (which will be debuting its own Apple TV app soon), the time was ripe for an Apple TV revision. According to Eddy Cue's presentation during the keynote, the new Apple TV will be available for ordering on September 15th and will ship on September 22nd. Presumably, 4K video will start to show up in iTunes and on the Apple TV around the same time. The new Apple TV 4K starts at $179 for the 32GB model, and the 64GB model will run $199. Apple will also continue to sell the 32GB 4th generation Apple TV for $149.